NEW YORK (6nobacon.com) — She may not be the 2012 cover girl, but Israeli supermodel Bar Refaeli is back in this year’s edition of the Sports Illustrated swimsuit issue. Three months ago it was reported that Refaeli and Israeli supermodel Esti Ginsburg would not be appearing in the print edition of the magazine’s most popular issue — but apparently plans have changed. While Ginsburg will appear only in the swimsuit calendar, Refaeli will be featured in a special segment titled Bar & the Boys, where she poses with NBA star Chris Paul, Olympic gold medalist Michael Phelps and Spanish tennis player Rafael Nadal. Perhaps the editors thought that letting Refaeli hang out with three half-naked athletes would make her feel better after she lost the cover to 19-year-old Kate Upton. Remember when rock bands were nonconformist rebels? It’s getting harder to thanks in part to the likes of KISS. The face-painted quartet led by Israeli-born Gene Simmons appears to have moved decidedly away from its rebellious roots with the news that the band is in talks to extend the KISS brand to video games. In an interview with Industry Gamers, Simmons said he wants to take the KISS brand to the online gaming industry. 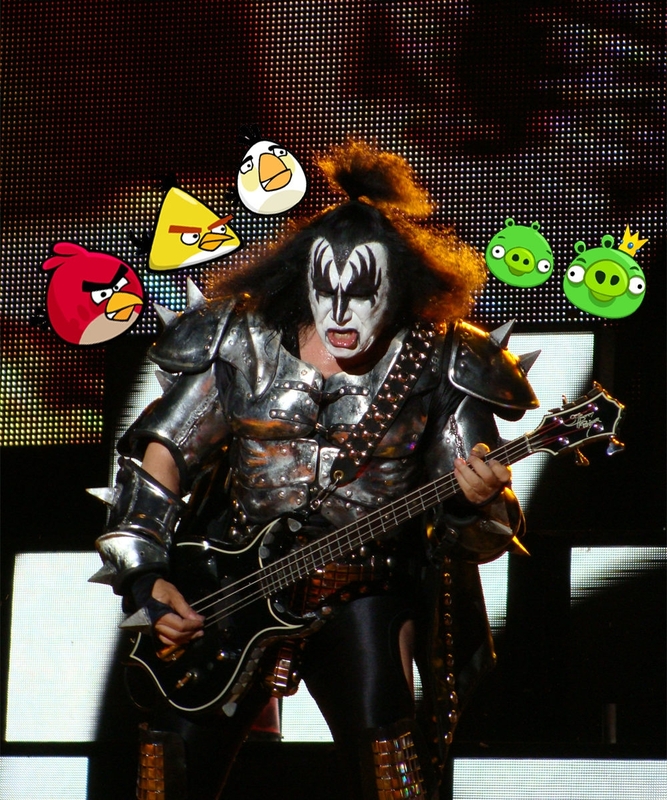 “We’re talking with Angry Birds, KISS and Angry Birds, which will become a deal,” Simmons said. Angry Birds is a mobile game in which the player uses slingshot to fire birds at pigs. It costs 99 cents. Simmons seems to be trying to emulate the success he’s already had hitching the KISS image to Hello Kitty. Apparently the fight for Muppet rights never gets old. After a failed campaign to allow the Muppets to host the 84th Academy Awards, slated for Feb. 26 in Los Angeles, filmmaker Judd Apatow is championing a new cause: winning the Muppets a slot to perform their Academy Award-nominated song “Man or Muppet” on stage during the show. Apparently there are only two nominated songs this year, “Man or Muppet” and “Real in Rio” (from the movie “Rio”). However, unlike past shows, neither song will be performed on stage, which means no Muppets performing at the Oscars. Apatow isn’t having it. He has been leading the battle via Twitter, together with celebrity blogger Perez Hilton, so far with no luck. There is, however, a Perez-led petition that you can sign, just for the sole satisfaction of sticking it to the man and seeing — maybe — at least one Muppet on stage. The romance between fashion designer Marc Jacobs and “South Park” has reached a new peak with the release of a series of three special T-shirts, designed by Jacobs, and featuring naked characters of the popular animated show. South Parkers Eric Cartman, Randy Marsh (Stan’s dad) and Butters are the lucky characters to get the Jacobs treatment. The shirts, part of Jacob’s Protect the Skin You’re In campaign against skin cancer, are the latest additions to a catalog of celebrities who have allowed their naked images to be used by Jacobs on his shirts. The campaign benefits the Interdisciplinary Melanoma Cooperative Group at New York University, and along with the “South Park” characters it also features celebrities such as Victoria Beckham and Naomi Campbell. The T-shirts cost $35 on Jacobs’ site. A group of fashion designers, singers, filmmakers and other celebrities joined forces in a show of support for the re-election of President Obama in 2012 in an event called “Runway to Win” that was hosted by Scarlett Johansson. Beyonce, Diddy, Russell Simmons, Marc Jacobs and Diane von Furstenberg were among the celebrities who didn’t wait for Fashion Week; they designed their own version of Obama-inspired clothing and accessories. In an interview with the Huffington Post, Johansson shared her belief that the Republican Party is “totally unfashionable” and also listed the president’s achievements in Obama fashion, using the word “change” a lot. “Change for American women: the first bill President Obama signed into law was the Fair Pay Act,” Johansson said. “Three women now sit on the Supreme Court for the first time in history. And insurance companies must now offer women cancer screenings and contraception at no cost.